Nathan Shearer put in an amazing performance at the 2016 IRONMAN World Championship. 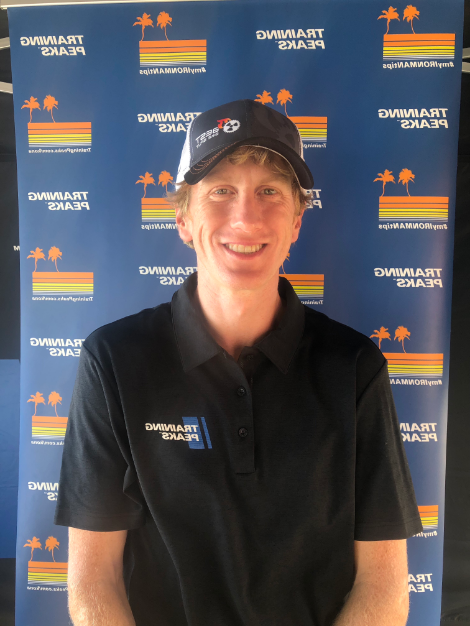 The fast 27 year old improved on last year’s 5th place age group finish with a 2016 winning time of 8:58:44, a full 20 minutes faster than 2015! Nathan uses both TrainingPeaks and Best Bike Split, so we will dissect his performance on the bike to see how he set himself up for the win. What is immediately apparent from looking at Nathan’s bike performance is that he did not go out too hard and tactically had a very smart race. Before the race I spoke with him about adapting his plan for the heat and humidity as needed. We had discussed in our pro preview that last year’s power numbers were significantly lower for most pros compared to their standard IRONMAN distance efforts. If athletes go out too hard, power tends to drop on the way back into town, and with the shifting wind conditions, this could start to have a bigger impact in the last 40 miles of the race. Nathan maintained a very conservative Intensity Factor® (IF®) of .7 where many athletes of his caliber will push that up to .75 or even higher. 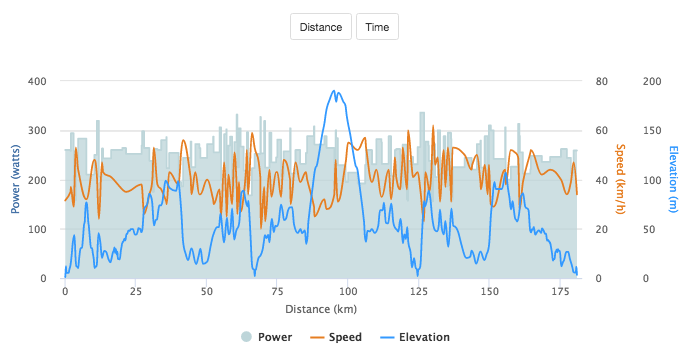 Nathan’s overall wattage is still high at 261 Watts Normalized and 251 Watts Average Power, but the stress he incurred was very low at only 231.7 Training Stress Score® (TSS®) due to his high Functional Threshold Power (FTP). Ultimately he used the bike leg to set up a great marathon in hot conditions. So, while his bike was only 4 minutes faster than the previous year, his marathon time improved by over 8 minutes allowing him to move up from 3rd to 1st in his age group. Nathan rode an incredibly steady ride with a VI of 1.04. If we break the course down into sections we can see where he used his power wisely. 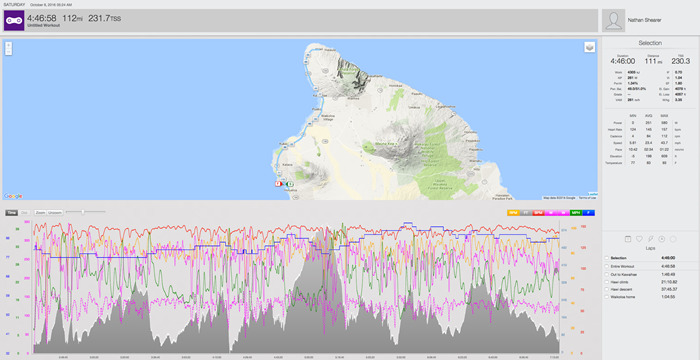 On the way out to Hawi he averaged 251 watts with a slightly higher Normalized Power® (NP®) of 263 watts. On the climb his average rose to 280 watts so he could maintain a strong pace and cadence to the turnaround. Comparing this to his pre-race plan, Best Bike Split had modeled a average of 254 watts on the road to Hawi and 276 watts on the climb. On the way back to town Nathan continued to pace extremely well with his average power dropping only slightly to 249 watts and a Normalized Power of 256 watts, which was exactly on track with his pre-race power plan. 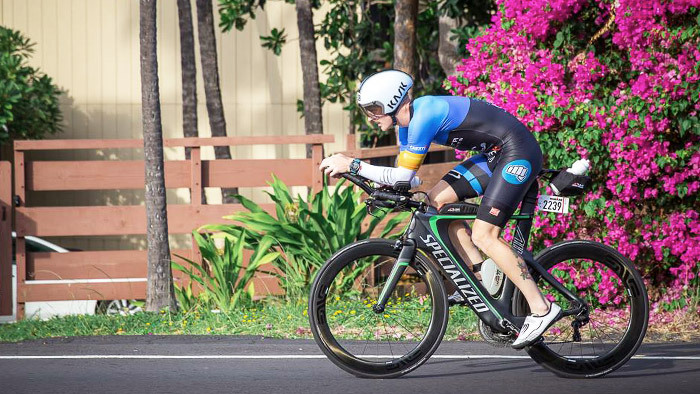 With the unpredictability of Kona weather, the winds shifted from the forecasted conditions. What was forecasted to be a slight tail wind on the way back to town turned into a head wind. So, while his bike time took a hit due to the shift, by planning for the lower IF he was able to adapt to the conditions and go on to have a very successful marathon.